Special Kids Photography of America, a 501 (c) (3) non-profit, was created to train photographers how to photograph children with special needs. 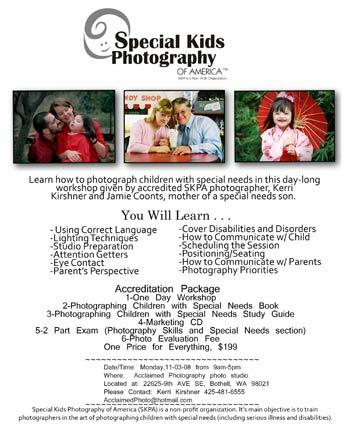 On November 3rd, in this day-long accreditation workshop, photographers will learn the art of photographing children with special needs. Topics include: Discussing the photo session with the parents, using the correct language, lighting techniques, preparing your studio, how to communicate with the child, posing/seating, attention getter’s, and MORE. The fee of $199 includes the workshop, two books (one workbook), two short tests and the photo evaluation fee. After you have passed the photo evaluation your name will be listed on the SKPA website. Call today to register for this workshop, 206-228-2442.